You’ve put in the time, and you’ve done the work. Are you ready for that job promotion? Jennifer Bridges, PMP, shows you what to do to earn it. Jennifer asked, “How can you stand apart from your peers?” Regardless of the size of the company or team in which you work, there will come a time in which you want to move up the corporate ladder. Before you ask for that promotion or get bitter because you’ve not been given one, Jennifer said that you must develop positive work habits. These behaviors will help differentiate yourself. Have a Positive Mindset: Nobody likes unnecessary negativity, which will get you all the wrong kinds of attention. However, having a “can do” attitude is contagious and can lift everyone you work with. That is the kind of attention you want. Respectful of Others: If you treat your coworkers poorly while flattering your bosses, you’re only going to plant seeds of resentment, and in time your behavior will be transparent. But genuinely having respect for others is also showing respect for yourself and the workplace. It leads to a culture where everyone helps one another and works better together, both in person and via collaboration tools. Open to Change: Change is inevitable, of course, but that doesn’t mean we always embrace it. Change is can be scary because it’s unknown. But when change occurs on the job, and it will, if you’re open to that change and face it without judgement, then if you do have a criticism it will be heard. Step Up to Lead or Support: Like helping others, you should also be open to taking a leadership role when it’s offered or needed. That doesn’t mean bullying yourself to the top and then passing on the work to others while you reap in the glory. It means taking responsibility and supporting the greater good. Utilize Systems and Workflows: There are mechanisms that are designed to help you work more efficiently. If you’re not using these tools, then you’re not taking full advantage of your ability to get things done. Always push yourself to do better by any means at your disposal. Or, there might be a better tool out there than the one you’re using. Suggesting a new project management software to improve efficiency could make you an office hero. Be a Problem Solver: Instead of throwing your hands up and saying you don’t know when issues arise, work towards finding solutions. If you’re actively seeking to resolve problems and not playing a passive role or fading into the background when they occur, you’re going to get noticed. Be Resourceful: Part of being a problem solver is being resourceful. You have limited time and resources to play with, so be creative and figure out how best to manipulate what you have to get where you want to go, as both a team member and in terms of your professional development. Follow-Up & Follow-Through: All these suggestions are not one-offs. That is, you can’t just do them once and sit back waiting for validation. You must follow up on what you say and then follow through and in fact do what you say. If you have, then you’re an active participant in your own advancement. But if you don’t, you’ll be seen as someone just trying to game the system and get ahead without having paid your dues. Jennifer closed her project management training video with a few tips to help you act correctly when and if you do get that promotion. Be grateful. There’s no law that says you must be promoted, even if you’re a good worker and have followed all the above advice. Nothing is guaranteed, and life isn’t fair. Therefore, if you do get promoted, say thank you and, more importantly, continue with those good work habits that got you there. Be graceful as you move into the new position. Don’t rub your promotion in other’s faces. Don’t act bossy. Continue to behave in the fashion that got you the promotion. Be confident. You don’t have to prove yourself, but also don’t take baby steps. It’s not the time to act timidly. If you have questions, ask. But, otherwise, move forward. Pro-Tip: One thing to look out for when you’ve moved into a new position is the fact that you might still be attached to the old one. You have to let go of your previous job, don’t hover over whoever has been place there in your absence. You can offer guidance if asked, but otherwise steer clear. You have enough new work on your plate. 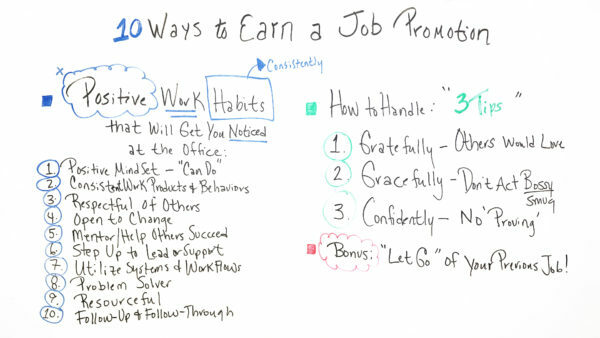 Today, we’re talking about 10 ways to earn a job promotion. Well, in today’s time, it’s not uncommon that you can be among your peers or colleagues who are superstars. So the question is how do you stand out among your peers? You also could be in a group of one or a group of just a few maybe who’ve been there for a long time and it’s just time for a job promotion. So in today’s whiteboard session, I want to talk about the positive work habits, habits meaning doing consistently on a regular basis that will get you noticed at the office. So what are these things? So I always say the little things can sometimes become the big things, for instance, positive mindset, having a good I-can-do attitude. Many times on projects or organizations, whether it’s startup companies or maybe it’s companies who’ve been around a long time doing the same thing, many times we encounter things that are new or problems that have to be resolved, really things with breakthrough thinking or innovation. So it helps to have a can-do attitude that things can be done. Also having or producing consistent work products and behaviors. Again, consistent meaning that it’s normal that you produce work products and either your teammates, maybe your customers aren’t waiting for you to produce something and they can always count on that it’s done correctly. Being respectful of others is a big thing, especially in today’s time. Recognizing that people think differently, they work differently and they need different things in order for them to get their work products done. Also, when you’re creating new things, you know, the idea of innovation is really big and in most organizations there’s at some point some initiative for change. So being respectful of others that other people have ideas, maybe they have concerns or even things that they need to discuss and being respectful of that. Also open to change. Again, there aren’t many organizations or companies that are not gonna experience some form of change. Also, people in the organization or your group notice when you step up to mentor and help others succeed. I mean, it can be a teammate, it can be a peer, sometimes it can either be some of your customers helping them to succeed. Also to step up to lead or support. Sometimes within a group or organization we have to step up and lead something new. Sometimes it depends on what the issue is. Sometimes other people are better to lead than others. So you either lead or support others who are leading. Number 7, utilize systems and workflows. By using systems and workflows, we’re just more efficient and more productive and that helps everything and people do notice that. And it also helps the projects or your teammates with the work that they have to do as well. Being a problem solver. Again, going back to the fact that things do change and problems do happen, and really taking the time to think through and having critical thinking about how to solve a problem and not pass it off to someone else or just let it sit and continue. So with part of being a problem solver sometimes is being resourceful. So if you can’t resolve the problem, being resourceful to find others or ways to resolve it is very helpful. And number 10. Even though it’s number 10, I think it’s one of the biggest ones to not just follow up on things but follow through to ensure they get done. So when you get your promotion, I think these are three tips on how to handle when you get the promotion because remembering that you could be in a group of the superstars or one of others who would love to have that job. So I say, accept the promotion gratefully, knowing that others would love to have that promotion. Also gracefully by not acting bossy or smug or superior about that you got the promotion. And also act confidently. At this point, there’s no proving you’ve been promoted, so there you don’t have to go above and beyond and do things to act proving to get that promotion. And I think a bonus is to be sure to let go of your previous jobs so you can fully embrace and perform your new one. So if you need some additional resources to help you earn a job promotion then sign up for our software now at ProjectManager.com.